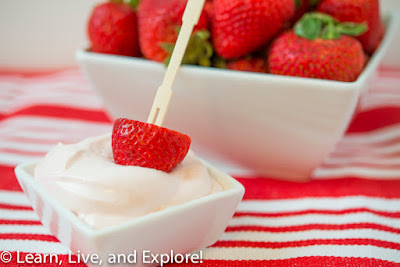 Fluffy Strawberry Dip ~ Learn, Live, and Explore! It's strawberry season!! And though I'm bummed I can't go out and pick berries fresh from the fields because of my knee surgery, I'm still going to make strawberry-based yummy treats! Today's strawberry inspired sweet snack is a dip for your fruit - strawberries or any other fruit you prefer. This recipe comes from Carrian at Oh, Sweet Basil, and with only two ingredients, you can't go wrong! Take the cream cheese out of the refrigerator and let it sit at room temperature for 10 minutes. Place the cream cheese and marshmallow fluff in a mixing bowl and beat with an electric mixer until smooth and combined. Serve in a bowl with cut fruit of your choice.